Whether you are spending the afternoon at a vineyard, enjoying a festival or tailgating at a steeplechase, we can outfit you with everything you need for elegant countryside events – from luxury picnic hampers, gift sets and linens – to Dubarry attire. Let us sweep you away for a romantic weekend. Enjoy dinner for two at Farm Bell Kitchen, cocktail tastings for two at Ragged Branch, one night stay at The Dinsmore Boutique Inn and two tour passes for Thomas Jefferson’s Monticello. There is no purchase necessary but you must be twenty one (21) years of age or older and a legal resident of Virginia at the time of entry to win. See website for complete contest rules. 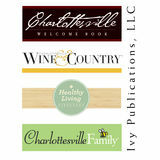 The Charlottesville Welcome Book is published quarterly by Ivy Publications, LLC. The views and opinions expressed by the writers and advertisers do not necessarily represent those of Ivy Publications, LLC, its officers, staff or contributors. The information presented here is for informational purposes only and although every effort has been made to present accurate information, we do not in any way accept responsibility for the accuracy of or consequences from the use of this information or for the businesses and organizations presented herein. We urge everyone to confirm any information given herein. All images not credited are property of and provided by Thinkstock by Gettyimages. No portion of this publication may be reproduced in part or in whole without the express written consent of the publisher. Copyright ©2018. All rights reserved. Welcome! Year-round natural beauty, hallowed halls of history, spectacular arts and music, and small-city sophistication — Charlottesville has it all! It is easy to see why Orbitz.com named Charlottesville one of the five places every American should visit! Here, you can walk in the footsteps of Thomas Jefferson at his Monticello home and at his beloved University of Virginia — both of which are World Heritage Sites full of fascinating history and interesting architecture — and you can relax in the scenic countryside he so admired, dotted with stunning vineyards, horse farms and Blue Ridge Mountain views. With so many wonderful places to enjoy here in Charlottesville, it can be tough to choose. So, we went to the experts to find out what they think is the best of the best. We polled our Charlottesville Welcome Book readers, locals and tourists about their favorite local businesses that exemplify wonderful customer service, from delicious restaurants, amazing boutiques, hot spots and cool clubs to wonderful resorts and awe-inspiring historical landmarks — and everything in between! Watch for the Welcome Book Winner logo on ads throughout this issue and in shop windows, and go to CharlottesvilleWelcomeBook.com to get the insider’s scoop on the best of everything our town has to offer. All of the award winners are highlighted in a special digital edition online, along with plenty of reader’s tips that will put you “in the know.” Throughout the winter, we’ll give away tickets to Charlottesville concerts, festivals and other events on our Facebook page at Facebook.com/CharlottesvilleWelcomeBook, so be sure to like and follow us for a chance to win! Check out our website to Mapquest any one of these locations! Regional Map Hot Picks for Vineyards & Craft Beverages! Regal Cinema & Stonefield Shopping Center dr au Seminole Square lic Rd Shopping Center . ket ntow St. n Ma Wat er S ll t.
Fra Muslin Ar t eum Rug by R d.
The Par Thea amoun Hist ter t oric Dow T ntow Sou he Jeffers n Ma ther The on ll n ater P Live Arts City Mar Wat P ket er S t.
Park ation N. 1 st S t.
Downtown Map Hot Picks for Local Eats! Barracks Roa ing Shopping Cen to nB lvd . Hot Picks for Finding a Home! “T h ve e Co rsi rn ty er Av ” e. s, a Main St. rk Ave.
discounted adult admission to Monticello, James Monroe’s Highland and Michie Tavern! Visit monticello.org for more information. Just 19 miles from Charlottesville, Downtown Gordonsville, which is listed on the National Register of Historic Places, offers shops, restaurants and historic sites. While walking down the well-cared-for streets of Gordonsville, shoppers can visit a plethora of charming specialty boutiques with everything from high fashion and jewelry to housewares, art and artisan goods. Love antiques? The town is home to a variety of wonderful antique collectors. You are sure to find something great! While downtown, visit the Exchange Hotel Civil War Medical Museum and learn about how a once lavish hotel that greeted railroad travelers was transformed into a hospital during the Civil War. Take a self-guided tour through the museum’s three floors of exhibits or consider an evening tour by candlelight, exploring why the museum is believed to be haunted to this day. Gordonsville is also home to an array of restaurants, from famous barbeque and southern comfort food to fine dining. Recently opened Rochambeau Restaurant is serving up fine French cuisine sure to please any palate. For the sweettoothed lovers, the town’s bakeries and ice cream spots are sure to delight. On December 2, the town will come together for the Gordonsville Memorial Christmas Tree Lighting, when locals can also place a light in memory of or in tribute to a loved one. Visitors will be able to see the tree throughout the holiday season. Love wine? Visit the scenic vineyards in the neighborhood to enjoy tastings, stunning views and unique events while you sip on local wine. Beautiful inns nearby also make for a lovely getaway and offer charming southern ambiance, mirroring other Gordonsville adventures. Whether you love a good ghost story or just want to experience the charm of this quaint town throughout the year, there is plenty to love and explore here. Discover the soft luxury and versatility of alpaca clothing which is lightweight, easy to layer, and the perfect choice for transitional clothing to span a change of seasons. Let us help you make the perfect gift choice for someone special or as a treat for yourself. Offering wearable art handcrafted by female artisans from imaginative blends of materials and methods – for that finishing touch! Distinctive combinations of metals, glass, beads and stones inspire notice and comments wherever you wear them. Fun Especially for Families More Historical Riches When visiting Monticello, make sure you save time for James Monroe’s Highland, the plantation home of our fifth president, James Monroe. Just two-and-a-half miles down the road from Thomas Jefferson’s “Little Mountain,” Highland is a historic presidential residence and working farm with more than 500 acres of land. Visitors are invited to tour the historic presidential residence, explore the amazing boxwood gardens and learn more about President Monroe and his wife, Elizabeth. For those seeing both James Monroe’s Highland and Monticello on the same day, the perfect lunch break can be found at the 18th-century Michie Tavern, just down the road from Monticello. Established in 1784 by Colonel William Michie, the rustic restaurant features hearty Southern fare and servers in period attire. Another presidential property to explore is James Madison’s Montpelier, the home of James and Dolly Madison. While visiting the 2,750-acre estate and mansion north of Charlottesville, you will discover historic buildings, engaging exhibits, active archeological dig sites and more. Scenic Scottsville Located along the James River, the little town of Scottsville is about 30 minutes south of Charlottesville. Founded in the 18th century, Scottsville exudes small town charm with historic and recreational fun. Start your visit by strolling through the historic district. Enjoy beautiful architecture, antique shops, delicious food, local brews and a museum capturing the town’s transformation from an 18th-century settlement to a bustling 19th-century river and canal port. Across from the Scottsville Museum, visitors can tour Canal Basin Square, an outdoor transportation park on Main Street. Learn about the area’s history and relationship with the James River. Explore a scale model canal lock, a full-size batteau replica and more. Award Winning Beers Outdoor Beer Garden Community Tap Nights Bingo, Darts, Trivia Weekend Entertainment Hops & Hymns & More! For a list of Tap Takeovers and Festivals, visit www.JRBrewery.com or Check out our events page On Facebook! www.TavernOnTheJames.com Tavern the James, located in historic Located inon beautiful, historic downtown Scottsville, downtown Scottsville, is a milTavern on renovated the James is historic near onenear millionone dollar lion dollar 100 year old building, a short stroll from theand scenic renovatedjust historic 100 year-old building just James River. The Tavern has been a short stroll from the scenic James River. The awarded numerous accolades including: voted Favorite Overall Restaurant Tavern has been awarded numerous accoladesin 2018. Attentive service and generous including 2018 Favorite Overall Restaurant. portions, reasonably priced, attracts tourists from 100’s of miles around. Attentive service and generous portions, Please join us at Tavern on the James, in reasonably priced, attracts tourist from beautiful downtown Scottsville, VA,afar. MonJoin us! 11am-9pm, Mon-Thurs: 11am-9pm • Fri: 11am-10pm Thurs: Fri: 11am-10pm, Sat: 8:30am-10pm and Sunday: 8:30am-8pm. Sat: 8:30am-10pm • Sun: 8:30am-8pm. Enjoy stunning Blue Ridge Mountain views while sampling award-winning wines, beers and ciders at beautiful settings in Charlottesville, one of the â&#x20AC;&#x153;Top 5 Destinations Every American Should Visit,â&#x20AC;? according to Orbitz Worldwide! Vineyards Bountiful & Beautiful Thomas Jefferson dreamt that Virginia wines would one day be plentiful and held in high regard, and today’s local vintners have accomplished that by producing wonderful award-winning wines. The Monticello American Viticultural Area (AVA), which includes Albemarle and surrounding counties, encompasses more than half of Virginia’s wine country and contains more than 1,200 acres of stunning vineyards. Virginia continues to excel in wine making, receiving both national and international acclaim for its wines. More than 40 local vintners offer up tastings from the lightest, lemoniest Pinot Grigio to the deepest, richest Merlot. Varieties special to the Monticello AVA include Cabernet Franc, Norton and Viognier. Cabernet Franc, lighter than a Cabernet Sauvignon, tends to have peppery aromas with hints of tobacco, plum or violets. The native North American Norton is deeply colored and might have notes of coffee and bittersweet chocolate. Viognier is a white variety that gives off floral or fruity aromas but is typically a dry or slightly off-dry wine. Whatever your palate desires — flowery, fruity, smoky or light — you’re sure to find it here. The finest wines from grapes tailored to Central Virginia soil. Vineyard Tours & Tastings Visiting Vineyards Getting out to experience the vineyards is easy, as all major roads are marked with the grape “Tours” signs, helping wine lovers navigate their way throughout the country roads. Central Virginia is so picturesque that an unplanned detour can be a lovely way to explore a part of the region you may not have discovered otherwise. You can also plan a wine tour with a group through one of the area’s transportation companies and enjoy being driven to various wineries. See the Regional Wine Trail map on page 20 to find your way around the Monticello AVA. Wine events and festivals bring thousands of visitors to the area. They come to taste the variety of flavors, enjoy local music and take in the glorious country views. In addition, many wineries offer tours, barrel and vertical flight tastings, multi-course wine-pairing meals and special events for connoisseurs and novices alike. This winter, we suggest getting cozy by the fireplace or firebowl at your favorite vineyard with wine by-the-glass or a bottle purchased from the tasting room. Many vineyards also offer meat, cheese and baguette platters for snacking. Situated on over 100 acres of rolling hills surrounded by the Blue Ridge Mountains, Septenary offers bar and seated tastings and an exclusive area for wine club members. While Thomas Jefferson is well known for his love of wine, hard cider made from apples grown on site was another everyday table drink enjoyed at Monticello. One local cidery uses one of Jefferson’s favorite varieties of apple, the Albemarle Pippin, to create a lovely hard cider that rounds out the range of beverages we’re proud to call locally made. While another cidery makes a delightful perry, a fermented pear juice. Be sure to save the date for Cider Week Virginia (November 9-18), when locations throughout the state, including the Charlottesville-Albemarle area cideries — Bold Rock Hard Cider, Albemarle CiderWorks, Castle Hill Cider and Potter’s Craft Cider — host tasting events, workshops and more. Virginia also has a long history of whiskey distilleries. The distillery at George Washington’s Mount Vernon is still in operation and was once the largest in America, producing 11,000 gallons of whiskey in 1799. In addition to the distillery at Mount Vernon, whiskey lovers can tour and visit local distilleries making craft vodka, gin and bourbon. Whether spending a winter afternoon touring a local distillery or visiting a craft cidery, there are so many ways to explore Virginia’s rich history of producing incredible spirits and cider. The Virginia Spirits Trail at VirginiaSpirits.org is a great place to start. You’ll find a map of Virginia distilleries, events, cocktail ideas and more. A few of the local distilleries, such as Ragged Branch Distillery, Silverback Distillery, Virginia Distillery Company and Vitae Spirits, offer anything from crafted vodka, brandy, bourbon, gin and rum to hand-crafted cocktails using these spirits. Devils Backbone Brewing Company also recently opened a distillery on its site in Roseland, Virginia, where it serves gin, silver rum and brandy. These impressive offerings are part of the vibrant local food and craft beverage movement in the Charlottesville area, which supports numerous vineyards and farms, too. These locally owned businesses give Charlottesville a distinctive flavor and preserve its stunning landscape. Spirits are high for the future of Virginia spirits with new tasting rooms continually popping up. Castle Hill Cider, a place to celebrate. Come visit. Drink our award-winning ciders. Wander the gorgeous grounds. Enjoy live music. We trust you’ll enjoy our rich history, and perhaps even create some of your own. We have daily tasting hours of 11-5, and host special events like weddings, corporate parties, and small gatherings —all sure to create beautiful memories. Brews to Taste Charlottesville is proud to be home to a myriad of microbrewers, taphouses and establishments that specialize in crafting or carrying outstanding handmade beers. Thomas Jefferson took great interest in creating not only wines, but also beers and ciders. In 1815, he wrote, “I am lately become a brewer for family use.” Monticello, in conjunction with our own homegrown Starr Hill Brewery, even crafted an artisanal beer: Monticello Reserve Ale. This Official Beer of Monticello was inspired by what Mr. Jefferson labored over and loved in a beer. Any visit wouldn’t be complete without ordering a bottle of this heritage ale, which can be found at a variety of local restaurants and beer and wine shops. Exploring the area’s breweries is a wonderful way to spend the day. The Brew Ridge Trail, which features six of the area’s local breweries — Blue Mountain Brewery, Devils Backbone Brewing Company, South Street Brewery, Starr Hill Brewery and Wild Wolf Brewing Company — starts in historic Charlottesville and meanders through scenic Albemarle and Nelson counties. Easily accessible by car, there are many local limousine and taxi companies that offer special rates for tours of the trail. A map of the trail and more details about each stop can be found online at BrewRidgeTrail.com. Beer lovers are sure to also enjoy a visit to Kardinal Hall, Beer Run, Three Notch’d Brewery, Champion Brewery, South Street Brewery and Pro Re Nata Brewery, among others, where you can experience a plethora of craft beer choices with delicious farm-to-table foods. Our local breweries have taken the craft brewing world by storm, with medals at the country’s top beer festivals and nationwide accolades. Some breweries have opened restaurants on site, so now visitors and locals alike can imbibe these fabulous beers while enjoying great food, amazing music and stunning mountain views. A farm-to-table cafe serving local, all-natural, organic food and coffee, specialty craft beer and wine store. Open 7 days a week, serving breakfast, lunch, dinner and our award winning Sunday brunch. We feature 24 rotating drafts, 1000+ bottled & canned beers and ciders, as well as over 500 wines with many local, organic and biodynamic offerings. Visit us online to map out your tastings tour! n to w Wat n Mall er S t.
Regal Cinema & Stonefield Shopping Hy Center dr au lic Rd . Wine & Dine Jefferson Style Jefferson’s Love of Food & Wine Thomas Jefferson was sometimes called “America’s first wine expert” due to his extensive experimentation in viticulture and oenology. Be sure to check out Monticello’s restored wine cellar in the passage beneath the house. A platform above the brick floor allows visitors entry to the wine cellar to see what it looked like during Jefferson’s retirement years in the first part of the 19th century. Try out the model dumbwaiter in the “Crossroads” exhibit to see if you could have transported bottles of wine upstairs to guests without mishap! Afterwards, stop by the dining room to examine Jefferson’s original dumbwaiter, which has been restored to its original working condition. The dining-room restoration was sponsored by Polo Ralph Lauren and marked the first collaboration with Monticello curators and archaeologists with regards to the dining-room ceramics. Excavations showed that, in Jefferson’s retirement years, the family most often dined on pearlware, an English earthenware similar to porcelain but not as expensive. A set of green, shell-edged pearlware now graces the dining room, on loan from The Colonial Williamsburg Foundation. Virginia is considered the birthplace of American wine. While Jefferson’s desire to have great wines locally available was never fulfilled during his lifetime, thanks to his unrelenting pursuits and successors, we can all now raise our glasses and revel in his dream come to fruition. To ensure that this dream continues, the Thomas Jefferson Foundation has partnered with Piedmont Virginia Community College to create a training vineyard on Montalto, Jefferson’s “high mountain” overlooking Monticello. Visit monticello.org, for touring details and history. A spectacular sight awaits visitors in the dining room, which features walls painted a brilliant chrome yellow. The color — which replaced the Wedgewood blue that inspired so many homeowners across the country — is not so new; it was chosen by Jefferson around 1815 to grace the walls that set the scene for many formal dinners, where rice soup, mutton and even a new treat — ice cream — were served. Wine & Dine Jefferson Style Fresh Local Foods Charlottesville lies among a few beautiful counties, including Albemarle, Nelson and Orange, whose rich agricultural history and farm community are well loved and supported by our many local restaurants and residents. Even the students at the University of Virginia have access to fresh produce through a food delivery program that partners with local farmers and artisans. Dining & Gourmet Hot Spots A modern Beer Hall close to UVA and the downtown with a fantastic line-up of 24 craft and European draft beers and local wine on tap. With an award-winning renovation, this beautiful lively space is ideal for hosting large and small events. The from-scratch menu reflects the best locallysourced raw ingredients for Alpine-inspired modern plates, classic bar cuisine and a catered menu, all on online. Our Award -winning patio/restaurant has ample seating in and out. We are always kid-friendly with 2 regulation courts for bocce ball, board games and ping -pong. Wine & Dine Jefferson Style Trendy Eats At the forefront of the farm-to-table movement, Charlottesville is a hot bed for gourmet food on-the-go. Food trucks are a staple of the city’s foodie culture, offering a variety of treats to tempt any taste bud. You can even occasionally find “food truck battles” — a fun way to sample the offerings of many mobile kitchens. From Southern-inspired cuisine, to sweet and sugary dessert-centric trucks, or even locally sourced booze-infused food, Charlottesville’s food trucks offer convenient and epicurean delight for the most discerning of palates. These trucks can be found throughout the city, from festivals and concerts to winery and brewery events and more. If you are strolling the UVA grounds during term time, you are sure to run into students in line for some of their favorite lunchtime dishes beside the University’s historic McIntire Amphitheatre. The university currently partners with The Pie Guy, Got Dumplings, Yum Yum Xpress and El Tako Nako. During UVA terms, you will likely find these food trucks MondayFriday during lunchtime. Head to a vineyard or brewery a variety of week nights and any Friday or Saturday night, and you are also likely to spot any one of Charlottesville’s delicious mobile kitchens, serving up dinner and delicious bites to enjoy with a local craft beverage. The Downtown Mall is another hub of trendy eateries that features an exciting array of both traditional and contemporary restaurants. Foodies are sure to love both the global cuisine and regional foods they can find on the mall. With everything from sushi, Mexican food and sandwich shops to drafthouses, Indian restaurants and ice cream parlours, there is a plethora of unique and innovative restaurants to be found tucked beside the local boutiques, art galleries and concert venues that line the Downtown Mall. Take Us On-theGo! No app necessary. 2017 Thanks for voting for us! Wine & Dine Jefferson Style Casual Dining If you spend an evening out on the town, there are a plethora of delicious places to dine late-night. From burgers to wings, you can without a doubt find a delicious bite to eat. Consider having a later dinner at one of the restaurants that turn into popular weekend bars and enjoy watching the Charlottesville night scene come to life. Charlottesville restaurants are known for offering the comfort of a casual dining environment without sacrificing quality. No matter what you are craving, from pizza to donuts, you are likely to come across it in the form of casual dining. Winter is a great time to huddle up beside a loved one and savor a casual bite. During the warmer months, many of the restaurants have a space to dine al fresco, whether you are dining outdoors on the Downtown Mall or are enjoying a local food truck! Food&Wine Pairing Join Charlottesville Wine & Country and Sommelier Will Curley in the elegant Library Room of Brasserie Saison on December 4th for a special evening discussing the pairings of reds and sparklings with amazing foods. For reservations and more information, contact us at: concierge@ivypublications.com | 434-984-4713 Each class is limited to 16 participants. The Arts & Music Scene Art That Moves You Surrealist painter Salvador Dali said, “A true artist is not one who is inspired, but one who inspires others.” Whatever medium may inspire you, galleries and artwork abound here in Charlottesville. Each first Friday of the month, local galleries and other venues on the Downtown Mall open their doors to display works of art in the popular First Friday Artwalk. A perfect place to start your walk is the McGuffey Art Center, located one block from the Downtown Mall. This gallery space is full of artists at work in their studios accented by a gift shop that carries a variety of members’ art throughout the year. You can browse the light-filled studios and multiple exhibition spaces at McGuffey itself. When you explore the Downtown Mall, check out Chroma Projects, where you can see Tim Michel’s “Ruminant” and Lara Call Gastinger’s “Documenting Fall and Winter” throughout November. The University of Virginia’s Fralin Museum of Art provides a sophisticated, high-tech home for the art contained within its historic walls. Alongside the permanent exhibits this winter, explore special exhibits, such as “Reflections: Native Art Across Generations” and “Camera Work: American Photography of the Early 20th Century” through January 27. A visit to the studio, gallery and printmaking workshop of landscape artist Frederick Nichols is just a short drive north of Charlottesville in Barboursville. Visit the Nichols Gallery Annex to see the work of Virginia artists. On the way, stop at Contemporary Art gallery Les Yeux du Monde just off Route 20. Les Yeux du Monde will feature Anne Harris Massie: New Paintings from November 16–December 31. After visiting Barboursville, head east to Gordonsville and see a unique collection of work by local and national artists at the Annie Gould Gallery. Whether you are merely appreciating or interested in purchasing, the Charlottesville Darrell Rose. Photo Credit: Jen Fariello area’s vibrant and robust art scene should not be missed. For more details, visit CharlottesvilleWelcomeBook.com. Handcrafted and locally grown in Handcrafted and locally grown in The Counties Arts & Music Scene through aromatics found in a glass of award-winning wine. Nelson and Albemarle Counties Nelson and Albemarle through aromatics found in a glass of award-winning wine. Festivals, farm markets, and arts and crafts fairs dot the calendar all year long, while museums and galleries offer world-class programming for artisan seeking visitors. Festivals, farm markets, and arts and crafts fairs dot the calendar all year long, while museums and galleries offer world-class programming for artisan seeking visitors. The Artisan Trail Network is designed for you to create a self-guided trip of enriching moments resonating with your personal interests. Enjoy outdoor recreational activities, old-time music, museums of all genres, world class concerts, and theatrical performances. Discover a hidden creek while hiking through a hardwood forest, or perch yourself on a cliff outcropping overlooking a pristine valley at sunset. Stroll vast fields in the footsteps of soldiers long since gone but not forgotten, and wind your way along roads once traveled by horse and buggy. Enjoy the local flavor of your destinations by choosing unique dining and privately owned lodging as you make your way from studio to farm enjoying the scenic landscapes and creative points of interest. AND LOCALL LE COUNTIES NELSON AND ALBEMARLE C The Monticello Artisan Trail is your passport LOCALLY-GROWN IN to wander the backroads and discover the tr Visit historical landmarks, sample our locally produced foods, linger along our sceni enjoy our award winning local wines and craft beers, and meet the artisans w MARLE COUNTIES & bricks; and glass to windows & goblets, the arts of Albemarle and Nelson will have you wanting to take a piece of Virginia home or return to experience these honored traditions time and time again! Visit working artisan studios where glass artists, wood carvers, potters, weavers, metal-smiths, quilters, and artists of varying media are preserving passed-down skills, or explore the boundaries of art-on-the-edge represented in the local galleries, museums, markets, and art fairs. Here it’s not just art...handmade and locally-grown is our way of life! Whether you are the bed & breakfast or country inn type, prefer a more traditional hotel, or love to embrace nature in a cabin or campground, you will find the rest you need to enjoy the Monticello Artisan Trail. Do it all – spend one night near a mountain stream, sitting by a crackling campfire under star-studded skies, then treat yourself to the privacy of a quaint cottage or mountain lodge for your vacation headquarters. Loiter at Rock-n-Creek Cabin, where a biker and pet friendly, fully appointed cabin off the beaten path and a stone’s throw from the Blue Ridge Parkway awaits you, featuring optional chef packages customized for you and your guests by proprietor and former presidential executive chef Richard Christy. Dining along the Monticello Artisan Trail is a culinary delight, with local venues offering an astounding variety and breadth of tastes and experiences. Local restaurants and farms that dot the pastoral landscape welcome the localvore, and farm-to-table meals will please even the most discriminating foodie. Experience adventurecherries, in your our County’s rows of strawberries, peaches, nectarines, apples, pumpkins seasonally. way and around Nelson County’s With boundaries including the Blue Ridge Parkway and the James River, outdoor 471 square mile playground natuIn addition to the sweetness of fresh-picked fruit, ouroforchards ciders,and preserves, eleven Virginiaoffer Birding Wildlife enthusiasts find our counties the perfect destination. Bike along Route 76, an beauty. Hike, bike, canoe orwatchable kayak candied fruit, and otherralfarm-fresh treats. A busy day on the trail will inspireloops. you to With Trail wildlife international destination for cyclists, or pedal the picturesque and challenging rural yourtable way around County’s reserve your place at the at one of theNelson many restaurants in the who proudly more breweries thanarea stoplights (one), roads of Nelson and Albemarle Counties. For the water sports enthusiast, there is support our agri-artisan community by Birding featuringand locally-grown eleven Virginia Wildlife produce and meats in Nelson County has ten wineries, three swimming, tubing, kayaking, canoeing, and rafting. Enjoy the annual Batteau Festival their delectable specialties. Trail watchable wildlife loops. With breweries, a hard cidery, and a single for an authentic historical perspective on the river. Traverse the James on the only more breweries than stoplights (one), whisky distillery –each poled ferry in the U.S. at Hatton Ferry. The Monticello Golf Trail has four courses for Nelsonmalt County has ten wineries, threewith award-winning products aand settings. With only two chain every skill level. For those adventurous of heart, try hot air ballooning! breweries, hardunique, cidery, scenic and a single restaurants, local venues offer an astounding variety and malt whisky distillery – each with award-winning prodculinary More than 44 lodging ucts and unique, scenicbreadth settings.ofWith only experiences. two chain offer a place for and a restful getaway. Hike Crabrestaurants, local venuesfacilities offer an astounding variety tree Falls,More the than highest cascading waterfall east of the breadth of culinary experiences. 44 lodging facilities offer a place for a restful getaway. HikeAppalachian CrabMississippi River, near Trail, then visit the east of the Visit Wintergreen Resort, Rock-n-Creek Cabin tree Falls, the highest cascading Montebellowaterfall State Fish Hatchery. Mississippi River, near Appalachian Trail, Ridge then visit the featuring four seasons just off the Blue Parkway, Rock-n-Creek Cabin Montebello State Fish Hatchery. Visit Wintergreen Resort, of mountain recreation and amenities including 45 holes country inn type, prefer a more traditional just off the Blue Ridge Parkway, featuringgolf fouron seasons of championship two courses; exhilarating winter amenities including 45 holes bin or campground, you will find the rest youof mountain recreation and Powering people skiing, ice skating, snowboarding, and snow-tubing; an , prefer a more traditional championship onand two tastings courses;year exhilarating Wineoflovers will enjoygolf tours ‘roundprogram; atwinter the over 40 vineyardsmountainand l. Do all –find spend one you night near a mountain award-winning tennis a full-service, nd, youit will the rest skiing, ice skating, snowboarding, and snow-tubing; anour fertile countryside. wineries nestled in stunning locations scattered throughout under skies, then treat yourself top spa;a full-service, outdoor recreation such as hiking, fly fishing, The Glass Palette We work hard to value and protect our scenic and vibrant rural landscapes. Residents nd onestar-studded night near a mountain award-winning tennis mountainThe unique climate and soilprogram; of this region have attracted some of the most creative Meg Chevalier adventure in Studio ourevery County’s and swimming; and fly a variety of enticing dining options. untain lodge your vacation headquarters. and businessesExperience live the “Buy Fresh Buy Local” philosophy day, recycling local ed skies, thenfor treat yourself top spa; outdoor recreation such astoday hiking, fishing, and accomplished winemakers working in Virginia who boast portfolios of wines investment and471 materials at every mile level. The craft breweries’ spent grain is devoured During the World growing and harvest seasons, enjoy iker vacation and pet friendly, fully appointed cabin square playground of natuand swimming; a variety of New enticing dining options. your headquarters. that balance the bestand of the Old and styles. Expect a warm welcome fromthe by the local cattle, and local wind power companies sell back energy through best of passionate Nature’s bounty — local Duringfamily-run the growing and harvest seasons, enjoy the fromfully the Blue Ridgecabin Parkway awaits you,the small, wineries, each about what theystrawberries, do and aboutblackbersharndly, appointed ralrenewable beauty.energy Hike, bike,Non-profits canoesupport or kayak the electric coop’s program. sustainable ries, andstrawberries, blueberries, more than small-batch 40 varietiesbreweries of apples, beststory of Nature’s bountyYou — local ing their with visitors. won’t want to missblackberthe several mized for you awaits and your dge Parkway you,guests by proprietor Buck Islandcommunity Bay Decoys green initiatives, like Powering People (poweringpeople.org), providing peaches, and pears, along with fresh vegetables, ries,hand-crafted and blueberries, more than from 40 varieties of apples, making ales and lagers local hops, cider-works producing hard flowyour way around Nelson County’s d your guests by proprietor Richard Christy. Dining along the Monticello education and alternative energy solutions/equipment to individuals, communities, peaches, andorchards, pears, along with fresh vegetables, flow-distillery ers,the honey, and herbs. Orchards and in farms offerMany tours, ciders from local and first single malt whisky America. Dining along the Monticello and other non-profit organizations in an effort to make aand significant difference in cal venues offering an astounding varietyof and eleven Virginia Birding Wildlife these linked byand twofarms distinctive trailsand that other wind through Nelson ers, hidden honey, treasures and herbs.are Orchards offer tours, pick-your-own experiences, farm products. how we use energy. Parks and resorts actively nurture the environment, honoring ing an astounding l restaurants and variety farms and that dot the pastoral and Albemarle – theexperiences, Brew Ridge Trail and thefarm Monticello Wine Trail festivals - with stops pick-your-own and other products. Every weekend throughout the year, andand events wildlife With and conservingTrail preciouswatchable natural resources...and even theloops. golf courses are getting d farms that dot the pastoral events that celebrate present theNelson perfectCounty path the thirsty adventurer. weekend throughout the year, festivals and for events arm-to-table meals will please even the seasonal mostEveryfestive - Naturally. TM in on the act with the Monticello Golf Trailthan boastingstoplights the World’s First(one), Green Golf Trail, als will please even the most more breweries celebrate Nelson County - Naturally. nelsoncounty.com featuring some of the best resort courses in the nation. just off the Blue Ridge Parkway, featuring four seasons of mountain recreation and amenities including 45 holes of championship golf on two courses; exhilarating winter skiing, ice skating, snowboarding, and snow-tubing; an award-winning tennis program; a full-service, mountaintop spa; outdoor recreation such as hiking, fly fishing, and swimming; and a variety of enticing dining options. During the growing and harvest seasons, enjoy the best of Nature’s bounty — local strawberries, blackberries, and blueberries, more than 40 varieties of apples, peaches, and pears, along with fresh vegetables, flowers, honey, and herbs. Orchards and farms offer tours, pick-your-own experiences, and other farm products. Every weekend throughout the year, festivals and events celebrate Nelson County - Naturally. Home to two of Thomas Jefferson’s masterpieces — Monticello and and the University of Virginia, Albemarle County teems with a lively, robust spirit of festivals, artisans, eateries, music, and more that engages visitors all year round. Our quiet, rolling hills, historic sites, and working family farms complement the dramatic vistas and energetic pursuits of the Blue Ridge Mountains, Shenandoah National Forest, and over 3,000 acres of county parks. Test yourself on the internationally recognized mountain bike trails at Walnut Creek Park, stick your toes in the sand at Chris Green Lake swimming beach, and then end your day with a country store picnic on the banks of the Beaver Creek Reservoir. We cater to creative travelers and outdoor enthusiasts who enjoy life from a variety of perspectives gained from kayaking the James or Rivanna Rivers, hiking meandering trails, or pedaling bike trails and quiet country roads past farmers engaged in working the land that’s been in their families for generations, side by side with crafters inspired by the pastoral agricultural surroundings. Charming main streets in the small towns of Crozet and Scottsville entice visitors to duck into storefronts, restaurants, and coffeehouses that can turn into a shopping treasure trove, a delightful culinary experience, or an impromptu musical interlude. Music lovers will enjoy major festivals, concerts of all genres, and in and dance performances for all ages in venues sprinkled across the from signature night-life club events and large outdoor amphitheate corner jam sessions in quaint country stores. Red, and White and Brew estivals, concerts of all genres, intimate theatre l ages in venues sprinkled across the region, ranging vents and large outdoor amphitheater shows to quiet country stores. Amid the vineyards, farms, orchards, and miles of preserved natural beauty of Albemarle County lies the vibrant community of Charlottesville with its energetic culture of music, film, literature, food, and festivals providing an abundance of activities non-stop throughout the year. Be sure to visit the C’ville Arts Cooperative on the historic downtown mall, featuring a tremendous range of art and crafts by about 60 contemporary Virginia artists year-round, or Lynne Goldman Studio at Barracks Road featuring unique fine craft gift items made by Artisans Center of Virginia juried artisans. The Arts & Music Scene Music & Theatre Experience engaging local performances and touring troupes this winter, like “Richard III,” until December at the Blackfriars Playhouse at the renowned American Shakespeare Center in Staunton — the world’s only replica of Shakespeare’s original indoor theater. In Barboursville, Four County Players will bring us “Hello, Dolly!” from March 15–April 14. Also this winter, the Live Arts Theater in Charlottesville presents “Seven Homeless Mammoths Wander New England” at the Founders Theater November 16–December 15. The Paramount Theater will welcome a variety of acts, including Moscow Ballet Presents: The Great Russian Nutcracker on December 9. Music fans will be excited to see big names this season, like Mumford & Sons at the John Paul Jones Arena on March 16, and Steve Earle & The Dukes on November 29 and Mandolin Orange on February 4, both at the Jefferson Theater. At The Southern Cafe & Music Hall, you can enjoy El Ten Eleven with Joan of Arc on February 1. The classical music lover can find plenty of performances around town as well, like the Charlottesville Municipal Band’s 96th Season Holiday Concert on December 9.
kids—probably the30 most inventively awful kids14, in 2013 history. November 22, 23, & December 6, 7, 13, at You 8PM won’t believe the24mayhem—and fun—when Herdmans November & Decemberthe 1, 8, 15, 2013 the at 2:30PM collide with the Christmas story head-on! Featuring lovable Tickets: Adults/$16; Seniors & Students/$14; Children/$12 characters, a few favorite Christmas carols, and a lot of laughs, this promisesSoNGS to truly be IN THEThE BEST CHRISTMAS CEllArPAGEANT EVER! Local calendar listings updated daily. Details and Tickets at www.CharlottesvilleBallet.org | 434.227.7592 Use Discount Code CVFWW for 10% Off Tickets to Select Events! Josh Clark, Ally Farzetta, and Constance Swain in The Taming of the Shrew, 2017/18. Photo by Tommy Thompson. A trip to the Blackfriars Playhouse, the world’s only re-creation of Shakespeare’s indoor theatre, will transport you to the vibrant, interactive, and hilarious stage of Shakespeare’s day. From the Yuletide Feast to making traditional Colonial Christmas crafts at Monticello, find many festive opportunities for a merry holiday season! A FREE COMMUNITY EVENT FOR ALL AGES! to make a difference this holiday season! 3365 Monastery Drive, Crozet is proud to support Toy Lift! BELK, JCPENNEY, SEARS PLUS OVER 80 SPECIALTY SHOPS & EATERIES. Located 3 miles north of University of Virginia on US 29 at Rio Road. If you love history and antiques, you’re certainly in the right place. Antique lovers and treasure hunters can enjoy dozens of antique shops and malls on Route 29 from Charlottesville towards Northern Virginia, as well as the two dozen or so shops along the scenic Route 250 west from downtown Charlottesville to nearly the top of the Blue Ridge Mountains in the village of Afton. Along Route 250, you will also enjoy views of some of the region’s finest historic estates and stunning countryside, set against the beautiful and stunning Virginia landscape. Start your day with the shops Downtown, have lunch, then spend the afternoon shopping your way toward the mountains through the beautiful Albemarle countryside. You can finish your day of treasure seeking while enjoying the lovely winter views from Afton, which is a treasure in and of itself. With so much history here, whether you’re interested in the Colonial era, Civil War era or anything in between or beyond, Charlottesville is the perfect place to explore and go antiquing. Two great stores just 5 minutes apart packed with antiques, local artisan-made items, reclaimed and repurposed furniture, Virginia wines and the largest selection of April Cornell in Virginia. Glorious Shopping! Charlottesville is a small city, but it boasts a big selection when it comes to shopping, from specialty boutiques offering an eclectic array of wares to favorite designer lines from popular national shops. Whether you are on a quest for a new pair of winter boots or the perfect Christmas gift, such as a silver or pewter Jefferson cup or a painting of the breathtaking Albemarle countryside to commemorate your visit, you are sure to find something unique and wonderful. Take a walk along Charlottesville’s Historic Downtown Mall, a pedestrian-only walkway first created in the 1970s. Here you can browse among the 120 charming shops along the brickpaved streets. Beyond the downtown area, Charlottesville has several distinct shopping areas that offer a great selection. Check out the stores along the Route 29/Emmet Street corridor, from as far north as Hollymead to south of the University of Virginia. You’ll find everything from large, nationally-known stores to locally-owned shops that reflect the individual flavor and style of our community. Travel along Route 250 from Pantops Mountain to Crozet to discover more shopping districts and beautiful scenery. With the abundance of choices, finding the perfect winter ensemble, decor or gifts will be both easy and fun! 105 W Main St, Charlottesville Offer valid at participating stores until 1/31/19. Not valid with other offers or discounts, purchase of gift cards, Oriental rugs, or consumables. One coupon per customer. Welcoming Places to Stay Sweet Dreams From a romantic country bed and breakfast with mountain views or a smiling valet who strides out to meet you at one of our elegant world-class hotels to every style of accommodation in between, Charlottesville offers the finest in lodging choices and comforts. Charlottesville is one of the most popular tourist destinations in Virginia, greeting thousands of travelers each year who come to soak up the beauty of our Blue Ridge Mountains, tour world-class historic attractions and attend popular festivals, concerts or University of Virginia sporting events. Charlottesville’s central location in Virginia makes it an ideal point to daytrip to from any point of interest around the state. When planning your visit, be sure to make your reservations in advance. Many frequent visitors come back, year after year, to stay in their favorite sought-after hotels and B&Bs. Wherever you choose to stay, we’re sure you’ll enjoy our hospitality. Enter a world of British tradition, with all the pleasures of a fine hotel blended with the charm of a country inn. A complimentary full hot breakfast buffet The LARGEST heated indoor pool in the area 100% non-smoking property Close to everything! Located in The Shops at Stonefield Relax in our spacious guestrooms featuring the Hyatt Grand Bed,TM a Cozy corner sofa-sleeper and a 42-inch flat-panel HDTV. Enjoy our complimentary Gallery Buffet Breakfast or try a bite from our 24/7 Gallery Menu. Centrally located in The Shops at Stonefield, discover entertainment, shopping, and dining just steps away. Never settle for staying any place less than Hyatt Place. To book, visit hyattplacecharlottesville.com Hyatt Place Charlottesville 2100 Bond Street Charlottesville, VA 22901 800.993.4751 Welcome to a different place. Tour Charlottesville on your own or take advantage of packages that will whisk you away to historic sites and vineyards. For a quieter retreat, opt for walking trails and outdoor pursuits. You are likely to find the local staff of your chosen accommodation more than happy to suggest daytrips for your enjoyment. Mingle with other guests at afternoon tea and share stories of your travels at evening wine and cheese tastings. Or simply sit back and relax in a comfy rocking chair and enjoy the rolling hills, impressive mountains and cool, clean air. Your hosts can also recommend an abundance of restaurants for every mood and palate and suggest ideas for nightlife entertainment around town. Whatever you choose, you’ll be pampered with continental or full breakfasts, indulged in friendly conversation with knowledgeable innkeepers and made to feel at home during your stay. Charm, history and nature – our area’s bed and breakfasts have all three. With no two rooms alike, you’ll have plenty to choose from when selecting a cottage, suite or room that reflects your personal style and needs. At any one of the area’s bed and breakfasts, you’ll enjoy all the experiences of a home away from home. The evocative spirit of Virginia’s original voices and visions of 3 presidents – Madison, Monroe, and most notably, the profound ingenuity of Thomas Jefferson – are presented in engaging ways with reference to the past, present, and future of this storied, historic region. Secluded Forest Setting 8 Wineries within 10 Miles Fine Dining and Shopping Scenic Hiking Trails Near Historical Montpelier On-Site Wedding and Events 18248 Buzzard Hollow Rd. Gordonsville (540) 923-0119 | UphillHouseBandB.com Use code UHCVILLE to save 10% when you call or book online. Historic Orange,VA is conveniently located near amazing vineyards, Civil War battlefields and Montpelier. Becoming a Local Welcome, Newcomers! Congratulations on choosing Charlottesville as your new home! Nestled in the foothills of the Blue Ridge Mountains, your new community is known for year-round natural beauty and small-city sophistication. Charlottesville has received countless accolades in recent years for a variety of reasons — from its delicious, locally-sourced restaurants to its active, sports-centric community. USA Today featured Charlottesville as a great place to invest in a home. “Take one of the nation’s quintessential college towns, throw in a big slice of American history, add golf courses and wineries, set it all in prime horse country, and the result is Charlottesville,” says Larry Olmsted for USA Today. We couldn’t agree more! You will find that locals go out of their way to make you feel at home here — whether it is with a simple smile as you pass one another on the Downtown Mall or by providing detailed directions to the nearest hiking trail to enjoy the spectacular summer blooms, fall foliage or breathtaking winter mountainscapes. We are in the center of Virginia, surrounded by gentle rivers, rolling pastures set amongst a beautiful landscape, mild seasons and an easy two-and-a-half-hour drive to Washington, D.C. or the Atlantic coast, with its sandy stretches of beautiful shoreline. Charlottesville’s geographic proximity allows residents to enjoy a mild climate with four distinct seasons. For locals, “green” doesn’t just describe the rolling hills that surround Charlottesville. Green is a way of life for our eco-conscious residents, businesses and local government. Charlottesville is leading the way to a healthier, cleaner future in Virginia and has been recognized with the Governor’s Environmental Excellence Award. The city and county are committed to making green choices affordable for residents and regularly fund rebates for environmental home improvements. Clearly invested in having a healthy tomorrow, Charlottesville locals are eager to make ecofriendly choices. Now that you know a little more about all the great local offerings, turn to page 64 for details on how to get settled in your new home. We welcome you! a wonderful new Virginia wine to enjoy each month. 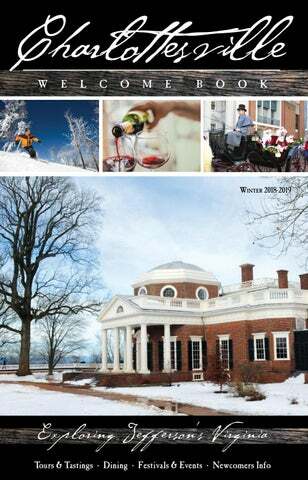 Affordable prices Free subscription to The Virginia Wine Journal Access to Exclusive Wine Sales ... and more! If you are new to the Greater Charlottesville area or starting a new phase in life, such as retirement, check out our website to see all the wonderful opportunities to meet new people that await you. Our mission --for more than 50 years-- is to welcome new members to the greater Charlottesville region and to provide interesting, fun activities for all Newcomers Club members. There are special events throughout the year. With more than 500 members there is something for everyone. Join us! Become a member. Start Here For city info, visit charlottesville.org. For county info, visit albemarle.org. Get on the Grid Where you get your electricity depends on where you live, with one option per area. Power providers include AEP-Virginia, (800) 9564237, appalachianpower.com; Central Virginia Electric Cooperative, (800) 367-2832, forcvec.com; Dominion Virginia Power, (866) 366-4357, dom.com; and Rappahannock Electric Cooperative, (800) 552-3904, myrec.coop. Fuel Up Natural gas service is available from the city of Charlottesville for city residents and some parts of the county: Charlottesville Gas, (434) 970-3211. Got Water? If you’re not in one of the county homes on well water, you’ll need to connect up with Charlottesville Water at (434) 970-3800 or Albemarle County Service Authority at (434) 977-4511. Take Out the Trash County residents may use the Ivy Materials Utilization Center or hire a private collection firm. Some of the private haulers will also collect recycling. The city provides weekly trash take-away; residents purchase stickers for 13-gallon or 32-gallon trash bags at grocery stores or an annual sticker available at City Hall, (434) 970-3830. Keep in Touch Landline phone service and/or Internet connections are available through CenturyLink, centurylink.com; Comcast, xfinity.com; Sprint, sprint.com; and Ting, ting.com. On the Road Within 30 days of moving to the area, contact the DMV for a new driver’s license and to title and register your vehicle locally: Charlottesville DMV, (804) 497-7100. Rock the Vote The easiest way to register to vote is to fill out a form while you’re at the DMV. Otherwise, call up the local registration office to get the necessary form: Albemarle County Voter Registration, (434) 972-4173; City of Charlottesville Voter Registration, (434) 970-3250. Make New Friends Are you new to Charlottesville or newly retired? The Newcomers Club offers a variety of activities: cvillenewcomers.com. Make a Difference There are lots of opportunities to help out those in need within our community. Check out volunteer opportunities on the United Way’s website: unitedwaytja.org. Charlottesville is home to an amazing variety of real estate agents who are well-versed in our eclectic selection of neighborhoods. Begin your neighborhood search with Belmont, a historic community within walking distance of Downtown, where you’ll find a mix of Victorian-style homes and adorable cottages with picket fences. Next, check out the charming neighborhoods of Rose Hill (close to Downtown) or Rugby Avenue (closer to the University of Virginia) and the surrounding neighborhoods. Driving west from Charlottesville, into Albemarle County, brings you to Ivy. Convenient to the city, this area has beautiful rolling hills with new and historic homes. Also west of town are prestigious neighborhoods such as Farmington, Ednam and others. A bit farther west is charming Crozet, close to many vineyards, golf courses and parks, with gorgeous mountain views. A mix of planned neighborhoods and rural living, Crozet has experienced a lot of growth while maintaining its country charm. Becoming home to more and more wineries, breweries and distilleries, this area is perfect for a quieter home only a skip away from the culturally rich city and world-renowned craft beverage industry. See more of the area’s growing industry on our Vineyard Guide on pages 20-21.
ettle into a spacious studio or one bedroom suite, offering everything you need to relax and stay productive. Charlottesville’s Upscale Extended Stay Hotel featuring 3 tot-lots! * Subject to state and local laws. Must be of legal drinking age. Light evening meal served Monday - Thursday. Charlottesville and the surrounding Albemarle County is a thriving, economically vital region home to approximately 145,000 residents and diverse job-generating enterprises from large employers to start-up companies. We enjoy viable non-profit enterprises, commerce, suppliers, research businesses and agri-businesses. The University of Virginia and its graduate programs attract talented students with infectious energy and exciting ideas who are a tremendous resource for local business. UVA, along with Piedmont Virginia Community College and the Charlottesville/Albemarle Technical Education Center, also provides the area with above par secondary education opportunities. In fact, in Forbes’ 2017 Best Small Places for Business and Careers, Charlottesville made the top 20 out of 200 locations. Major employers in the area include the University of Virginia, State Farm and the U.S. Department of Defense. Charlottesville also has a thriving small business community that provides our town with its unique vibe. Be sure to check out our biggest job fairs next spring, such as the PVCC Annual Job Fair. Beautiful Smiles They’re Our Specialty! Education Matters Charlottesville is a fabulous place to raise a family. The University of Virginia provides us with a highly educated population, diverse cultures, strong employment, college sporting events, a lively arts scene and state-of-the-art health care. From preschool to post-graduate, excellence in education is important here. Parents of little ones will find a huge variety of preschools, from creative co-ops to international immersion programs. What kind of life do you want your A COMPASSIONATE Life child to live? Charlottesville’s long history of prioritizing education is exemplified in our many schools. Not only are the public school systems exceptional, but our area boasts more private-school opportunities per capita than most, offering everything from competitive college-prep programs (with boarding options) to schools based on the teachings of alternative leaders in education. Charlottesville City Schools, Albemarle County Schools and area private schools believe in the evidence behind exposing students to a wide variety of experiences, viewpoints and opportunities so they can develop their own interest areas and strengths. From fine arts, STEM technologies and academies, and computer availability to project-based learning, immersion language curriculums and multi-age classrooms, students have the tools needed to learn and apply in all aspects of life. Learn all about Charlottesville’s educational opportunities at CharlottesvilleFamily.com. THE RIGHT CARE, RIGHT AROUND THE CORNER Whether youâ&#x20AC;&#x2122;re new to the area or a longtime resident, you already know Charlottesville is a special place. And now we invite you to learn how Sentara Martha Jefferson Hospital is a special, patient-centered healthcare provider. With our hospital right off I-64 and 250, outpatient care centers and emergency departments in two locations, and primary and specialty care practices all across the region, Sentara Martha Jefferson Hospital is here with the highest quality healthcare for your entire family, when and where you need it most. You never know what life may bring, so isnâ&#x20AC;&#x2122;t it reassuring to know that the right care is always right around the corner? To find a Sentara physician near you, visit FindaCvilleDoc.com.